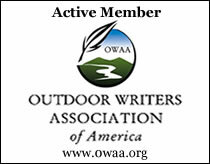 This entry was posted in Skills and tagged Dennis Neely, historical trekking, Mountain Man, Native captive, North West trade gun, Northwest trade gun, trade gun, traditional black powder, traditional black powder hunting, traditional blackpowder, traditional blackpowder hunting, Traditional Woodsman. Bookmark the permalink. 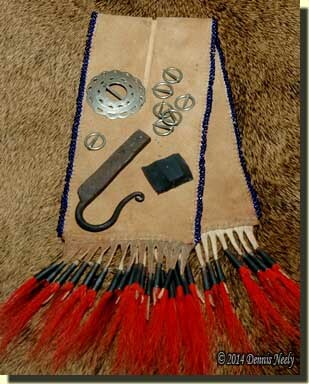 I don’t know if you have had a chance to talk with Darrel yet after the School of the Longhunter, and this is off topic, but we learned in Mike Galban’s presentation on tumplines that highly decorated native items such as this were probably out of the price range of most frontier hunters. Intricately woven tumplines and things like your split pouch were often three to four times more expensive than a normal, plain item. Yes, Matt, I’ve heard many good reports on the presentations at Prickett’s Fort, including yours and Michael Galban’s comments about ornamentation with respect to tumplines/portage collars/carrying strings. This split pouch is “inspired” by Major Andrew Foster’s split pouch, which is quilled, but still well-used. When I post on this accoutrement next week, I will take you through the thought process I used and you will see that it is actually quite plain by intent. The edge beading and deer-hair cones are basic representations of the work done by the Ojibwe and Odawa here in Michigan in the late 18th-century as demonstrated on a number of artifacts, especially those gathered by Foster and Sir John Caldwell. Keep in mind that this split pouch would not have been sold to a frontier hunter, but rather made by an Ojibwe or Ottawa woman for use by an adopted family member. Oh yes, I remember now that Darrel said you are working on a persona about a captive returning to the settlements after living with the natives, makes perfect sense that you would have something like that. I have been thinking of making some changes to my kit to better reflect that of a person living on the frontier. I just picked up a pair of leather leggings and puckertoe mocs. A lot of my gear looks just too well made and clean. While I am not a fan of the “200 year old look” I do like a simple, well used, look. That is what I am going to for now. I am thinking along the lines of more items made on the homestead instead of purchased trade items.